The Panasonic FS22 offers full touchscreen capability. In its second new camera announcement of the day, Panasonic has revealed its new 'fast-response', 16.1MP compact, the Lumix DMC-FS22. Following on from the Panasonic G3 announced earlier today (read our Panasonic G3 review), the Panasonic FS22 adds to the Lumix range a 16.1-megapixel compact camera with 4x optical zoom (28-112mm equivalent) and touchscreen functionality. Like many new Panasonic cameras announced this year, the Panasonic FS22 allows for full touch-screen operation on its 3in LCD. Users may employ the touchscreen to set AF tracking, capture images and play them back. What's more, by setting the Intelligent Scene Selector in the iA mode, the Panasonic FS22 automatically switches to the appropriate mode according to the subject touched. Other new touch operations on the Panasonic FS22 include Make-up Mode, Beauty Retouch and Image Stamp Mode. The Panasonic FS22 also features an Intelligent LCD which automatically adjusts the screen brightness in 11 steps as the surrounding brightness level changes, Panasonic says. This latest Panasonic compact camera also uses the company's Venus Engine VI and Intelligent Resolution technology for high-speed performance and greater clarity and detail, the manufacturer claims. 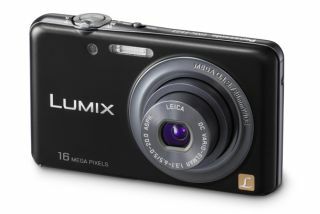 Panasonic claims the Lumix DMC-FS22 boasts a response time with the shutter release time lag as short as 0.006 seconds. Other key features of the Panasonic FS22 include full HD video recording, MEGA OIS (Optical Image Stabiliser) and Intelligent ISO Control. The Panasonic FS22 will be available from July.